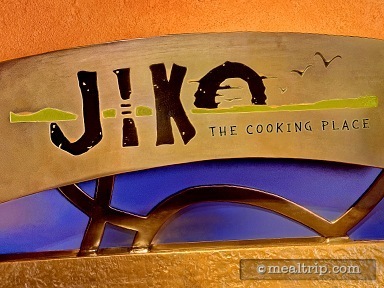 Jiko is located on a lower floor of Disney's Animal Kingdom Lodge, and for those that aren't familiar with the resort, it can be a bit hard to find. All of Animal Kingdom Lodge's dining locations seemed to be grouped quite close to one each other though... so if you follow the smell of food and the din of dining, you'll be in the right area. (Hint, if you're entering the resort through the lobby, hop in an elevator and hit the down button… you will be very, very close to Jiko). 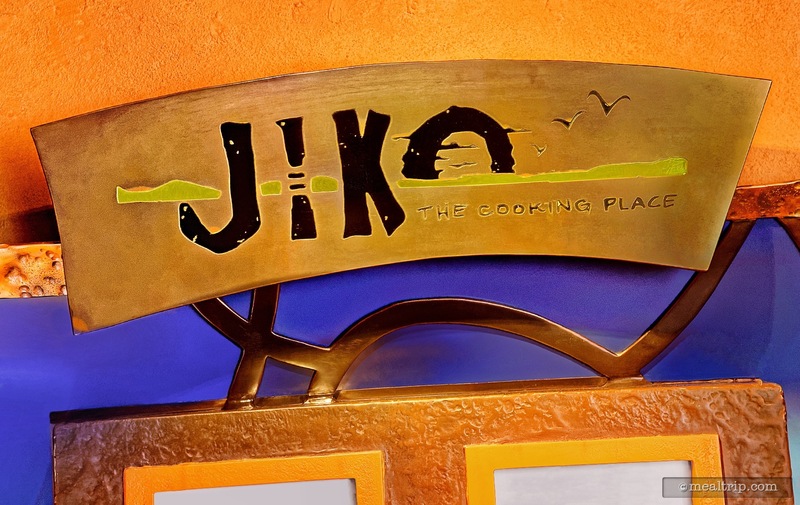 There are a few restaurants at Disney Resorts and in the Parks that are classified as "Signature Dining" experiences, and Jiko is one of them. The location is only open for dinner (usually from 5:30pm until 10:00pm and there is even a loosely enforced dress code (no tank tops, swimsuits, cut-offs, town clothing and garments with offensive language). You can tell from the moment that you walk in, there has been more attention paid to dining area details that at other locations. There is an open show kitchen (where mostly appetizers are prepared) and two wood-burning ovens glow to match the burnt orange, reds and gold tones that accent most of the area. This is all offset by a rich blue ceiling that's decorated with golden winged creatures (i.e., birds), and the whole effect is quite nice. It is a bit harder to see some of the color details at night. By day though, there is a lop-sided natural light streaming in from the floor to ceiling windows on one side of the room only. Twilight, it would seem, is the best time to visit Jiko. The culinary team a Jiko delivers on the title "Signature Dining" with a blend of African, Indian, and Mediterranean cuisine that changes seasonally. Starters include a couple of artesian wood-fired flatbread such as a Roasted Cauliflower Flatbread or the Peri Peri-roasted Chicken Flatbread with combines Lime Chakalaka, Lamb Chopper Cheese, and Pickled Sweet Bell Peppers. Appetizers are a great way to get a feel for a certain ingredient if you're unsure about African cuisine. Some options include the Wild Boar Tenderloin with Mealie Pap and Truffle Oil and a great "Taste of Africa" bread plate with spiced dips. There is usually a soup and salad or two on the menu, depending on the season, and like most Signature Restaurants, there are a couple Artisanal Cheese Boards that are thoughtfully created and presented. You will find the same kind of entrees at Jiko's that you would find at a fine steakhouse, but with more ethnic accompaniments. Guest favorites include the Filet Mignon served with jumbo asparagus, spoon bread and a South African Wine Sauce, or the Botswana-style Seswaa Beef Short Ribs. Those wanting to explore some seafood options have dishes like the Senegal Scallops with a Demi-glace, Piri Piri Swordfish with Truffled Mealie Pap, and a Maize-crusted Halibut to choose from (the specific seafood entrees may change from day to day). There's even a very unique vegetarian Tofu Sambusas with Mint-Coconut Chutney, Coriander-Tarmarind Yogurt, and Saffron-Cashew Rice dish that you won't find anywhere else! The desserts are (I hate to dive into editorial because this isn't a review per say, just a description), but the dessert options aren't as diverse and unique as some of the starters and entrees seem to be. There are some very unique specially teas available like the Organic Rooibos South Africa, a Masala Black Tea Chai, and a Lemon Verbena… along with some great African inspired coffees. Wine… is a huge part of the Jiko experience, and special wine dinners are offered from time to time as well.